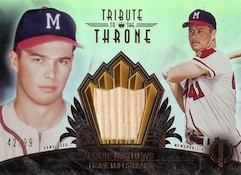 2014 Topps Tribute Baseball sticks with the brand's trademark of mixing low-numbered hits, modern technology and a decidedly classic vibe -- both with design elements and player selection. The high-end release delivers an autograph or memorabilia card in every pack that is numbered to 99 or less. Overall, the design shares a lot of similarities to past years, most notably with the Refractor-like card stock that has long been a brand trademark. However, there's also an Art Deco spin to it, offering something new. 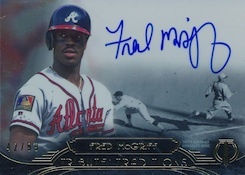 Autographs play a huge role in 2014 Topps Tribute Baseball with every six-pack box promising four of them. Base Autographs are all signed on-card. Besides the regular versions that are numbered to 99 or less, there are seven parallels: Blue (#/50), Sepia (#/35), Green (#/25), Gold (#/15), Red (#/5), Printing Plates, Purple (1/1) and Onyx (1/1). Following a similar pattern, both in numbering and parallels, are a pair of new inserts: Tribute Traditions and Tribute to the Pastime. These are also hard-signed. Timeless Tribute Autographs (#/24) feature two autographs, pairing a veteran with a retired player who shared similar playing traits. Tribute to the Stars (#/24) and Eccentric Eye Black (#/5) return. 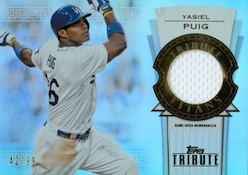 Relic themes have been largely overhauled in 2014 Topps Tribute Baseball. The main sets, Tribute to the Throne, Forever Young and Tribute Titans, all push the Art Deco feel. Each set is numbered to 99 with six parallels: Blue (#/50), Sepia (#/35), Green (#/25), Gold (#/15), Red (#/10) and Purple (1/1). Tribute Milestone Relics have pieces of baseballs used during an important game from the 2013 season. 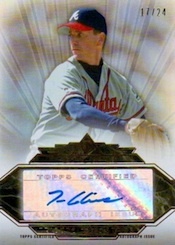 Tribute Milestones also has a one-of-one autographed parallel. 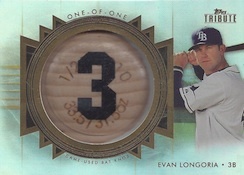 Rare memorabilia cards include Prime Patches (#/24), Batting Gloves (#/2), Bat Knobs (1/1) and Bat Plates (1/1). 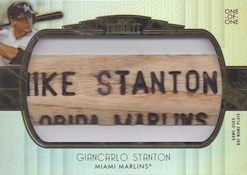 2014 Topps Tribute Baseball also has one-of-one relic cards featuring belt buckles from a pair of game-used pants. 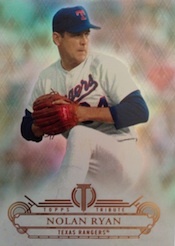 The 2014 Topps Tribute Baseball base set once again mixes current players with retired greats. Parallels include Blue (#/99), Green (#/50), Gold (#/25), Red (#/5), Printing Plates and Purple (1/1). Serial Numbered 1/1. 1:4,554 packs. Good: Lots of on-card autographs, lots of content from retired players, elegant base set design. Bad: Risky price tag given some of the players on the checklist, single-color swatches don’t belong in high-end sets like this. The Bottom Line: If you’ve bought Tribute before, you probably know the risks. Few products deliver as many on-card autographs. The designs are elegant, particularly the base set. But then there’s the gamble. Tribute comes with a high-end price tag yet you can land single-color relic swatches or signatures from guys like Jean Segura. Even if they’re not the worst players in baseball, their inclusion in such a product is tough to handle if you land one. 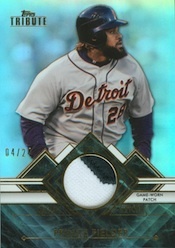 But when you’re able to hit something solid, few sets offer more attractive cards. Like past years, Tribute is a gorgeous. 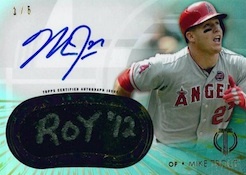 The combination high-end reflective foil and on-card autographs is second-to-none. The base cards also use a simple approach to the same foil card stock and the results are equally impressive. Where the set falters a little is the many color-based parallels a lot of the cards have. Some work, but a lot of the time the results aren’t nearly as nice as the base version. I was a little concerned when I saw the mock-ups for some of the art deco-inspired inserts sets like Forever Young Relics and Tribute Traditions Autographs. And while the background images can still be little much, they do look much better in hand than I thought they would. One of Tribute’s hallmarks is that it has one of the biggest rosters of quality retired players each year. 2014 is no different, however it seems to be getting tougher to land some of them. The retired content is also crossing over more into Topps Archives territory with players perfect for a low- or mid-range product. 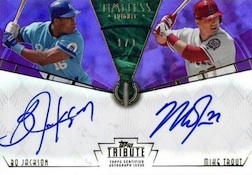 However, it’s tough to justify guys like Kevin Mitchell and Matt Williams in a product like Tribute. The same can be said for the current players. It’s tough to imagine many people plopping down a solid chunk of change for a pack or box and getting a plain white jersey of Gio Gonzalez. One thing that I did notice about Tribute is that there is a ton of parallels. While everything in the product could be considered “rare,” I don’t know if having so many levels where the color changes are subtle are the way to do it. For a product like Tribute, I’m looking at the player, the piece and the signature more than the serial number. Personally, I’d be okay with fewer numbered cards or higher print runs if it meant simplifying the checklist somewhat. Any product like this is going to be a gamble. Even with lots of weaker players, not many sets offer a better mix of players from the past and many current stars. The amount of on-card signatures is also extremely impressive. Like most any hits-based product, some are going to get greats packs and boxes while others are going to feel gutted. It’s important to know what’s in the product before delving in and being ready for a worst-case-scenario. Something that’s apparent is the fact that many of the repeat signers are seeing dwindling returns. This is to be expected. 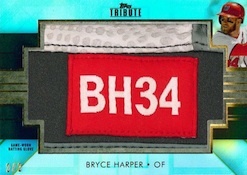 To offset this, Topps is bringing in new players who either haven’t signed for Tribute at all or it has been a few years. And while this is good, guys like Jose Canseco aren’t going to bring the same value high-caliber Hall of Famers debuting a few years ago. Probably the biggest turnoff when it comes to value is the fact that Tribute still has lots of plain swatch cards from current players. If you throw a bat or jersey piece my way from the 1960s, I’m probably not going to worry about it. But a plain white swatch of a current player who’s solid but not great isn’t fun to pull in a high-end product, no matter how low the serial number. I’m a sucker for pretty cards and Tribute has some of my favorites. In an age where so many autographs are on stickers, the abundance of on-card signatures is another major plus. Granted, the box I busted was better than a lot of others I’ve seen but even without a couple of decent cards, there’s a major allure to the designs. Now if only the checklist could get beefed up some more and the plain white jerseys could be left for more reasonably priced products. Love this product,Will Avisail Garcia be in this years set? How do they only have one dodger on the auto checklist? Where do you come up with a price of $169.99 for Hobby boxes? The cost on this product isn’t even close to that price & no one even on Ebay is selling it for less then $245.00 and it doesn’t even release till tomorrow. Your link to buy boxes is for a $169.99 Atlanta Braves share of a Box Break!! Steve � Thanks for the heads up. We try to filter out breaks but sellers come up with new ways to describe them. It’s fixed. Tribute delivers again. One issue is that #’s do not match checklist. Some are #’d to 40 instead of 35. Other wise great photos and background. suds99 � There were unannounced Orange (#/40) and Yellow (#/30) parallels. Sepia is numbered to 35. The checklist is now updated to reflect that. More autograph hits per box, four versus the usual three as in past Tribute editions. More autographs means more on card autos as well, which is now and thankfully the standard. Yes, fewer cards per pack which means fewer base cards produced. I pulled eleven total base cards in my first box. 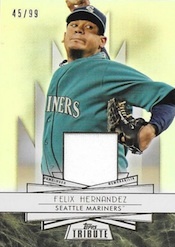 Topps also cut the number of base parallels in the rainbow. This should result in a little higher demand and value for base and parallels. For the most part there appear to be more refreshed player images for the veterans. Seven numbered cards and only two numbered over 50. I was personally happy because I have been seeking to replace Marichal and Rice sticker autos with on card autos, so it filled a couple of items on my checklist. And I collect Frank Robinson, so the parallel was a small bonus. I’m sure some Tribute fans won’t like the higher price for less cards, but personally the quality of the hits, at least in this box was good. Only a fool would pay $250 for a box of this crud. The checklist is far too similar to last year’s. The “Traditions” autos are a joke, they used 3 generic black and white photoshopped images of old baseball players and slapped them on a card with a modern player. No correlation between the old photo and the current player. The # of parallels has gotten out of control to the point where it’s hard to differentiate between each one. Not to mention the value isn’t there. Save your money and buy six boxes worth of singles for the price of busting one box yourself. I pulled a deion sanders gold auto redemption out of my box is it going to be #15 or #30 I seen gold autos # out of 30 on the stuff I seen but on the list u have says golds # to 15? Can u help me with this thank u.
joey zehnder � If the redemption is listed as Gold, it should be #/15. There is a Yellow parallel, numbered to 30, that looks similar. Thanks for the info on serial #’s. Just opened 3 more packs at my local card shop and pulled a onyx Jason Grilli 1/1 auto, Steve Carlton auto /40 andYount bat /35. Quality of product is great but tuff for set builders. Save your money people and buy guaranteed items that are sure to bring value. I got a James Shields autograph, Ryan Zimmerman, and David Freese autograph. 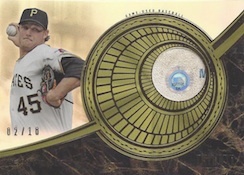 A Wil Myers jersey card out of 4 packs at fifty bucks a pack. Shove this! Did amazing in my first box. Open the 1st pack and get a Johnny Bench auto 1/5. Open the 4th pack hit two printing plate autos in the SAME PACK!!!!!!!!! So amazing! Product is so nice that i tried a second box and pulled a eccentric eye black auto /5 Troy Tulowitki Auto!!!!! Some luck huh? The set is great! It’s a good size to collect and the cards are well made and really nice looking I was very happy with the players autos except for the use of the Sharpie silver and gold auto’s. They tend to wear down quickly and start to look sloppy when they do. Card companies can afford to provide these guys with some high quality, comfortable writing utensils. And I bet if they did, players would be more apt to sign nicer autographs if the pen really smooth and easy to use. Plus, I have a question? How can the “per pack odds” possibly be different on these? Purple 1/1 (1:1,751 packs), Onyx 1/1 (1:1,152 packs) theres only 1 of each, lol ?? riddle me this Topps?